The SFG-1000 Series, an economic function generator with high accuracy and high stability output, are designed based on the DDS (Direct Digital Synthesized) technology embedded in a large scale FPGA. 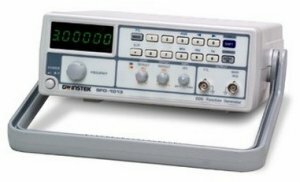 The 3MHz frequency range and the output waveform selection of Sine, Square, Triangle and TTL available in the SFG-1000 Series adequately provide the fundamental functions to ensure high confidence in test results. The DDS technology at an affordable price gives a high value solution to the users who need a signal source for accurate but simple measurement applications.